Be the belle of the ball, a Princess in the royal court . . .
or the Princess at your Princess theme Birthday party. Every Princess big and small needs a tiara.We have the perfect tiara for you! The tiaras are made of a metal material whether it is gold or silver, and then coated in glitter to give you that little extra glitz and glam. Is an Elvin princess, sorcerer queen, interstellar royal, or anime warrior your newest cosplay character? Our tiara's should be on your cosplay shopping list! The Glittered Birthday Princess Tiara is the perfect tiara for the birthday girl. It’s silver and obviously glittered, so it’s going to catch everyone’s eyes. It will help give the birthday girl the spotlight she deserves, making her the center of attention. That’s the way it should be, because it is her party after all. Don’t be surprised that even weeks after the party if you’re daughter is still wearing this tiara around. Another great occasion for a tiara is for the bride-to-be to sport one at her bachelorette party. The Glittered Bride To Be Tiara is perfect for this final night of freedom. 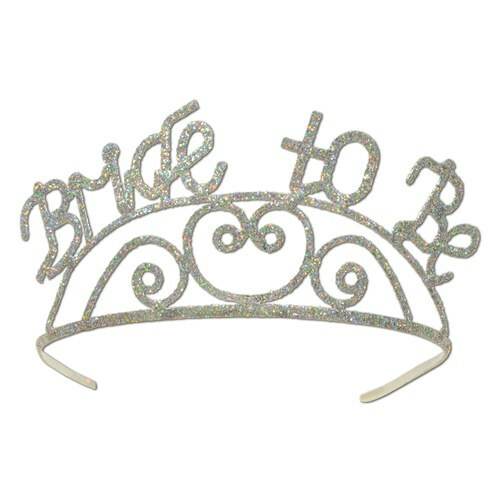 This metal tiara is fully decorated with plenty of silver glitter that is going to sparkle as much as the bride to be! It comes with two attachable combs and it’s going to be a hit at the bachelorette party. Even when the party ends, she will have this tiara as a keepsake for many years to come. With all of these tiaras we should certainly have one for you and your princess. Because after all everyone needs a tiara, no matter what kind of tiara or crown you're looking for, we've got you covered right here at PartyCheap.com!